Anne is a full time worker who also runs two blogs. I don’t know how she handles it all but she does. She offers product reviews, giveaways, takes part in memes and even provides links to other blogs and giveaways. My main blog is Mommy Has to Work. I started it to make extra money. That didn’t happen, but I enjoy doing it anyway. I post about going green and recycling, saving money and lately have quite a few giveaways, most geared toward eco-friendly products. I recently started a second Blog Mommy’s Reviews and More, just another outlet for reviews and giveaways. Don’t do too much at once. I had a back log of products to review. It takes time. More than I thought. I started out contacting different companies. i looked for products that were eco-friendly and just emailed them. It was easier than I first thought. Now I also get some companies that contact me! I love the Snack Taxies and ReUseIt Sandwich bags. I know such a little thing, but I use them everyday! Some ask for too many links and keywords to be added to the review. I don’t mind promoting them, but some are very detailed. I would love to work with the big names. I don’t think my blog is big enough yet, though, but who wouldn’t want a new fridge or washer and dryer. Do they get to keep those? Ireally like promoting the “green” and eco-friendly products, so anything in the area. Well, on my profile, I list 2 children, but I actually helped raise my husbands three sons too. And I tattoo permanent make up at the doctors office where I work. Oh and sometimes I can be a pain, ask my husband. The Twilight series, I know it’s everyone’s, but it was so good. I’m not cool enough to have one. 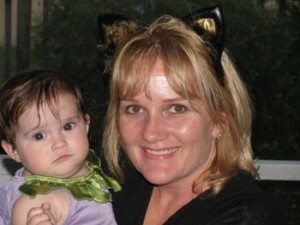 So far I attended the Social Media Moms Celebration at Walt Disney World in February 2010. It was awesome! Forgive me. Sometimes I get a little testy and I don’t really mean it.